There's little need to go into great detail about a new Sirenia album. Founder and principal composer Morten Veland and company offer another album of bombastic symphonic power metal with their sixth album, Perils of the Deep Blue. Of all the symphonic and gothic power metal bands in the world, I always thought Sirenia was the one to fill the gap when Nightwish parted with Tarja. Nearly every album reminds me of mid-period Nightwish. I'm sure the band tires of the comparison. Alternatively, when comparing this work with previous Sirenia albums, there's little distinction to be found. Call them a fluid series or a blur of the same, their music is certainly consistent and predictable. Melodic and symphonic, grand and bombastic are the continuous descriptive refrain for any Sirenia work. Of course, you must toss in Veland's pesky death vocals into the mix. Doesn't he ever get tired of this cliche in the gothic metal genre? While Sirenia does not disappoint by providing the expected same, they did toss in one song that caught my interest. That would be Ditt Endelikt (Your Demise) which has a great catchy rock groove and, gasp, Veland singing clean. Sirenia needs to explore this motif more often. Otherwise, with Perils of the Deep Blue, Sirenia simply stays true to their calling, offering more symphonic power metal. 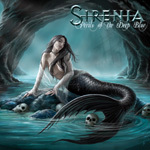 With Perils of the Deep Blue, Sirenia simply stays true to their calling, offering more symphonic power metal. There's not much more to say.